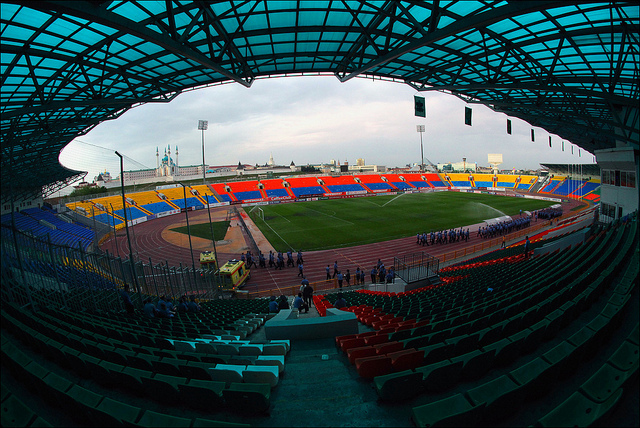 The Central Stadium with the impressive Kazan Kremlin as its backdrop. Some 150 Latics supporters made the long and expensive journey to Kazan. They deserved something better than this. There have been worse performances by Latics in recent years and a 1-0 loss away to a team with a strong European pedigree does not look so bad. But it was so depressing to see Wigan Athletic playing a brand of football that has been the hallmark of teams like Bolton and Stoke. Young Lee Nicholls continued in goal in place of the injured Scott Carson. Coyle brought back Thomas Rogne at centre back, with Ryan Shotton moving over to right back in place of Emmerson Boyce. Stephen Crainey came in at left back for James Perch, who moved in to midfield. At long last Roger Espinoza was given a start lining up, with captain for the night, James McArthur, to complete a central midfield trio. Callum McManaman and James McClean played wide, with Grant Holt being recalled at centre forward. Latics started cautiously, with hopeful balls forward their only weapon. It looked like they were looking for a goalless draw. However, after 22 minutes that possibility evaporated. In one of the few quality moves in the whole match Rubin’s Israeli midfield player Bibras Natkho put a lovely pass over Stephen Crainey’s head. Full back Oleg Kuzmin raced through and put in a powerful shot that went straight through rookie keeper Lee Nicholls and into the net. Apart from putting the big men up for set pieces Latics posed little threat. The only quality move of note was when Espinoza put in a superb long cross from the left wing. Holt rose well but was not able to keep the header down and it went over the crossbar. The rest of Latics football in the first half was forgettable, with Rubin not much better. Wigan came out in the second half with more resolve and started to take the game to Rubin. The approach was ‘Route One’. It looked like we were watching Sam Allardyce’s Bolton, but then were echoes of Stoke as Shotton put a series of long throw-ins into the penalty box. Using this method Latics were able to put pressure on the home defence, without creating clear-cut chances. Coyle took off the hapless Perch after 60 minutes and Nick Powell came on. The youngster soon went on a mazy run before unleashing a good shot from 30 yards that went just wide. For the remaining 30 minutes the talented teenager was to see the ball go over his head most of the time. Coyle brought on Marc Antoine Fortune for the cumbersome Holt after 71 minutes, then Jordi Gomez for McManaman three minutes later. Soon after another superb cross from Espinoza was met by Rogne, whose header hit the crossbar. In the end an out of form Rubin team gained a victory that practically puts them through to the knockout stages. Latics played with spirit and commitment. Roger Espinoza made a successful return, his energy and work rate being second to none. Moreover he provided moments of quality together with his incisive running. The crosses he put in for Holt and Rogne were inch perfect. Once again Coyle showed a lack of tactical awareness. He sent out a cautious lineup with three holding midfielders. For the second time this season Coyle put James Perch into a midfield role. He must have realized his mistake when he took Perch off on the hour. I might run the risk of repeating myself, but Coyle has an abundance of quality midfield players at his disposal. To put someone as technically limited as Perch in that position is hard to understand. Holt was not the right man to start at centre forward in this match. He looked slow and out of touch. The more mobile Fortune would have been a better choice, but maybe Coyle had Sunday’s game at Yeovil on his mind. The French Guyanan is not particularly effective at jumping for the high balls which were the mode of operation for Latics in the second half. The wide players, McManaman and McClean, were not able to get into the game. On the few occasions McManaman did run at the defence he was fouled. Latics wide play is just not getting the results it should. Without Boyce on the right of defence McManaman was starved of decent passes. The Route One approach did not help in this game. It seems to be ingrained in this Latics team that the long ball is the tactic in the second half. The quality players in midfield and on the wings become marginalized as defenders hoof the ball forward. The back four in this match were all Coyle signings.They were either incapable or unwilling to play the ball out of defence in the way that the likes of Caldwell, Scharner and Alcaraz would. Or were they putting through those hopeful long passes under the manager’s instructions? Lee Nicholls: 5 – a tough European baptism for the young keeper. Ryan Shotton: 5 – defensively solid, but his distribution was awful. Thomas Rogne: 6 – solid in defence and unlucky to hit the woodwork yet again. Needs to work on his passing. Leon Barnett: 6 – solid in defence, but poor in distribution. Stephen Crainey: 5 – just does not look the part although used the ball more effectively than on previous occasions. James Perch: 4 – poor. Taken off after 60 minutes. James McArthur: 5 – could not put his stamp on the game. Roger Espinoza: 7 – made some errors in his passing, but his energy and creativity were a real asset. Callum McManaman: 5 – systematically fouled and heavily marked. Came off after 74 minutes. Grant Holt: 4 – out of touch. Taken off after 71 minutes. James McClean: 5 – the fingers pointed at him for not marking his full back when Rubin scored. An enigma – full of promise but does not deliver. Nick Powell: – did what he could, but the style of play did not suit him. What a player he might have been had he come to Wigan a year earlier! Jordi Gomez: – hardly saw the ball. Marc Antoine Fortune: – heavily marked except on one occasion when he shot into the side netting with unmarked players waiting for the ball in the box. Most of his defenders don’t have the passing or on the ball ability of Alcaraz or Ramis . So they play safe….